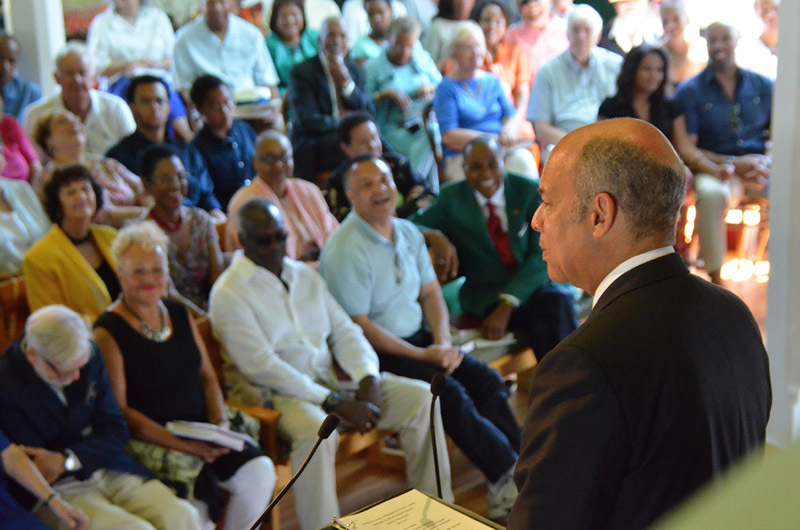 Jeh Johnson, summer visitor to the Vineyard for more than five decades, spoke at Union Chapel Sunday. 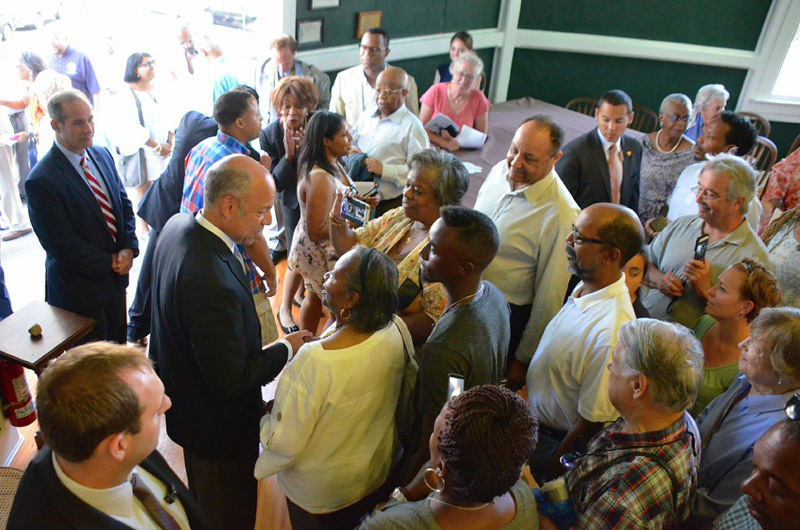 When Jeh Johnson, a member of President Barack Obama’s cabinet, distinguished attorney and summer visitor to Martha’s Vineyard for more than five decades, stepped forward in the pulpit of Union Chapel Sunday, the congregation threatened to burst the old octagonal walls of the historic Oak Bluffs chapel. Every seat in the pews was taken, the balcony was full and more than a few stood in the back. 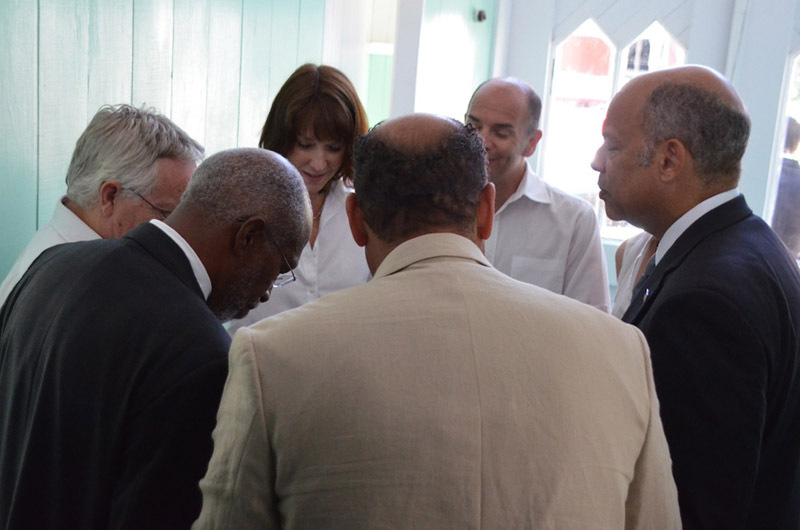 Among the notable people in attendance were Louis Sullivan, former Secretary of Health and Human Services, U.S Customs and Border Protection Commissioner R. Gil Kerlikowske, former Massachusetts Attorney General Wayne Budd, and John Wilson Jr., president of Morehouse College. Mr. Johnson is the Secretary of the Department of Homeland Security, a cabinet level position created following the 2001 attacks on the World Trade Center in New York city and the Pentagon in Washington, D.C. The position is the culmination of a lifetime of public service and leadership. Mr. Wilson and Mr. Johnson were classmates at Morehouse and rivals in a 1979 election for class president. Secretary Johnson engaged in some good natured one-upsmanship with his friend when he told the story of losing that election. Mr. Johnson said he is often asked to speak in public, testify before Congress, or appear on television news programs. But until Sunday, he had never been asked to speak from a pulpit and deliver a lay sermon. He framed his sermon around his deep attachment to the Vineyard, a place he said he has long cherished as a respite from his relentless responsibilities in public service. He recalled every house his family had rented in Oak Bluffs during those summers, right down to the street address, associating those houses with events that shaped his life. One was a house on Chestnut avenue, which his family rented in 1967. He also said he associated the summer of ’67 with the release of the movie Guess Who’s Coming to Dinner, the fictional story of a young white woman and an older African American man who meet at a university in Hawaii. She brings him home to meet her parents. When the movie was released, interracial marriage was illegal in 17 states. Secretary Johnson said he recently watched the movie again, and took note of a scene he had forgotten in which the father, played by Spencer Tracy, is having a talk with his future son in law, played by Sidney Poitier. He quoted the scene. Secretary Johnson was struck by the uncanny irony. An early supporter of President Obama, he recalled meeting the future president in 2006. “Something told me then, that I was being asked to take a ride into history, and that I better get on board that bus,” he said. 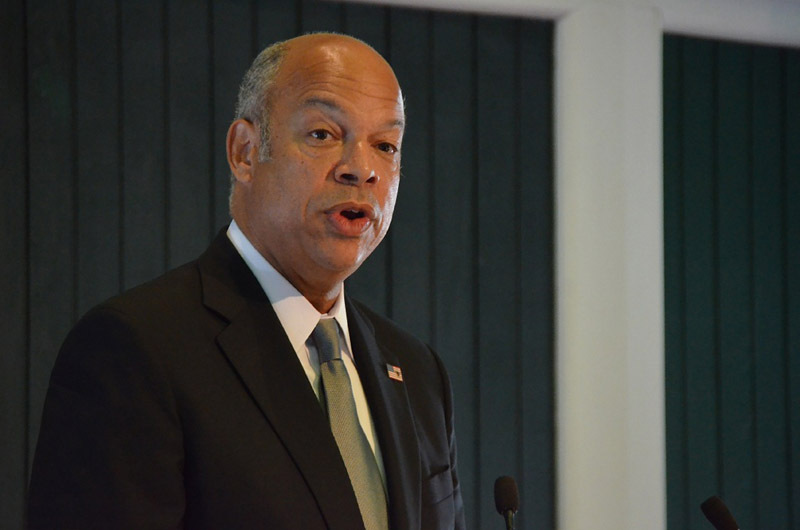 Returning to present-day affairs, Mr. Johnson reminded the audience that homeland security is a balancing act. He said he could create a perfectly secure world for each American citizen, but it would seem like a prison. He touched briefly and indirectly on the current political climate, placing it in contrast with the advances in racial and religious relations that he said were unimaginable 50 years ago. 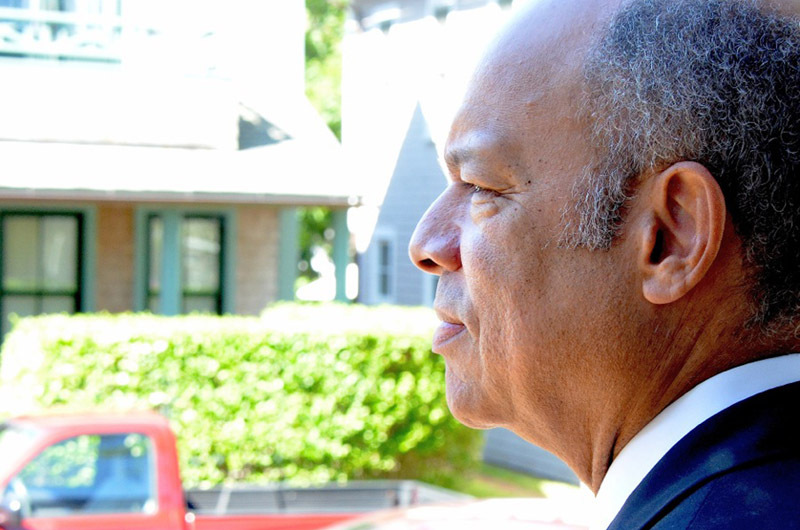 Secretary Johnson finished his talk with a poignant anecdote about his grandfather, a distinguished sociologist who did not live to see desegregation take root. Dr. Charles Johnson was called to testify before the House Un-American Activities Committee at a time when political figures led by Sen. Joseph McCarthy cast damaging suspicion on many people in academia, entertainment and government with insinuations they sympathized with Communists. The hearings were held in room 311 of the Cannon House Office Building on Capitol Hill. Secretary Johnson is familiar with the room. The congregation at the chapel rose in unison with sustained applause, not sitting down again until Secretary Johnson took a curtain call of sorts from the pulpit to acknowledge the cheers. 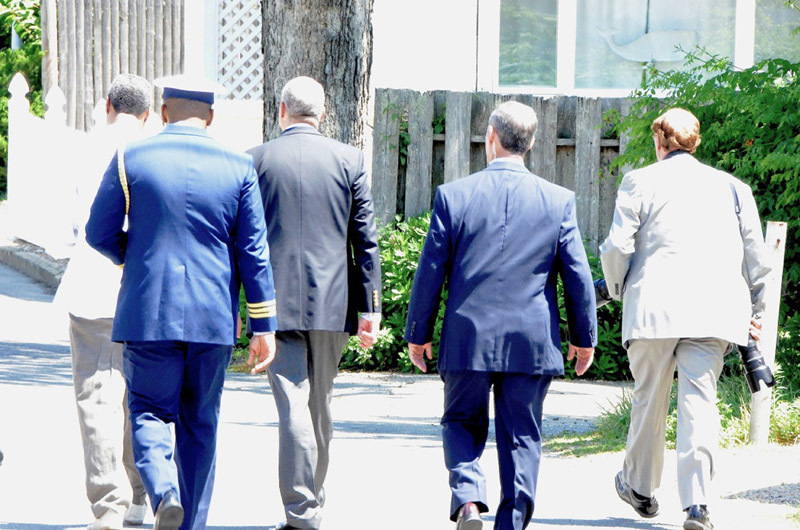 After greeting many admirers who wanted a word, a handshake or a picture, the U.S. Secretary of Homeland Security and his family walked out into a glorious day, and strolled down the middle of Kennebec avenue to get on with the rest of their Vineyard vacation. How great is that? This August with Johnson, Jarette, Holder, Opra, Gates, Spike Lee, Clinton & Obama here this island should be the safest place on the entire planet or the most dangerous for three weeks and the biggest party the island liberals have ever had which will include major Fireworks! I'll pass. As a native Washingtonian and a resident of the Vineyard for a quarter of a century, he can go back to Chevy Chase whenever he's ready. And, hopefully, he will not be the head of Homeland Security a year from now when the Fourth comes around again! I heard that P.O.T.U.S 's cabinet member stayed at the very swanky Surfside Inn in Oak Bluffs. Was The Island House sold out? Thank God for a place called Martha's Vineyard. A place where I go to an owner's association meeting of which roughly 65% of the owners are black (I'm Caucasian). A place where there still seems to be some sanity and caring for All our human brothers (and sisters). Thank God for creating a place of sensibility and caring in the midst of man-created chaos.